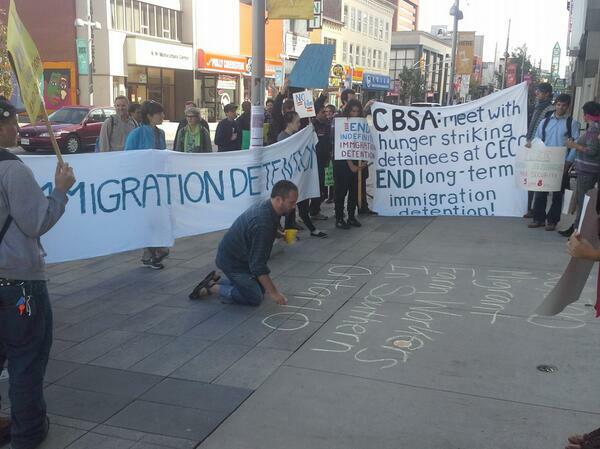 Communities across Ontario took to the streets, and pressured provincial officials to improve migrant detention conditions at Lindsay jail where 191 immigration detainees have been on strike since September 17th. Check out the pictures and updates below! Mainstream media: Canadian Press, Guelph Mercury, Chex Television and Kawartha Lakes This Week. 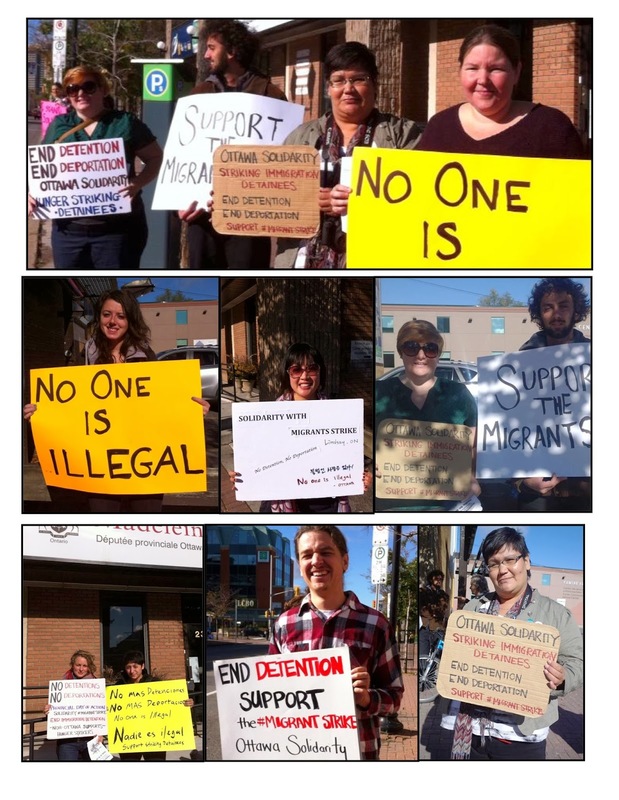 Listen to a message from one of the striking immigration detainees on the day of action here. Please sign the petition and take action! Guelph After updating on the current situation of the detainees, their demands and the solidarity campaign, a group of activists marched to Guelph’s MP Frank Valeriote’s office. A meeting is scheduled with Frank the following day. 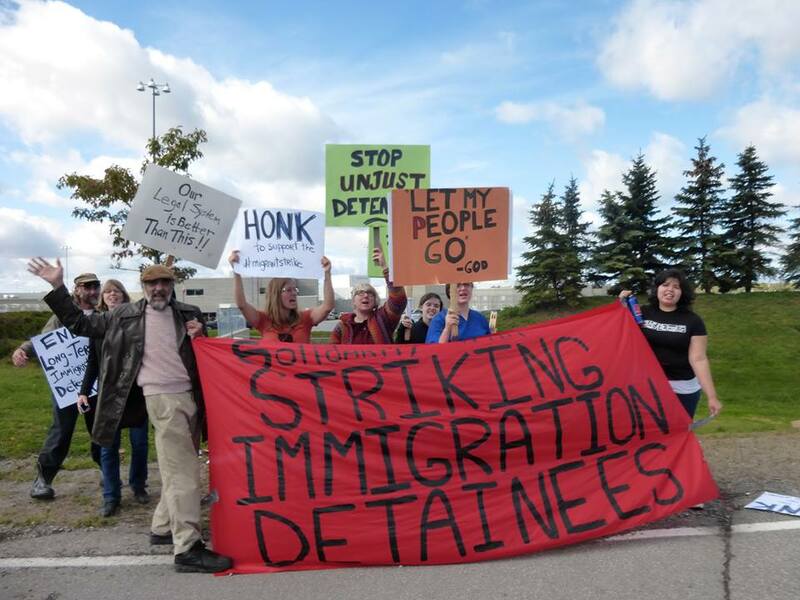 Having MP’s bring this up in parliament is one of the tactics Guelph activists are pursuing, however they will continue to direct pressure in various ways until the demands of the detainees are met. More information and pictures here. Kitchener-Waterloo A group of protesters marched from the Ministry of Community Safety’s local office to a local media outlet. 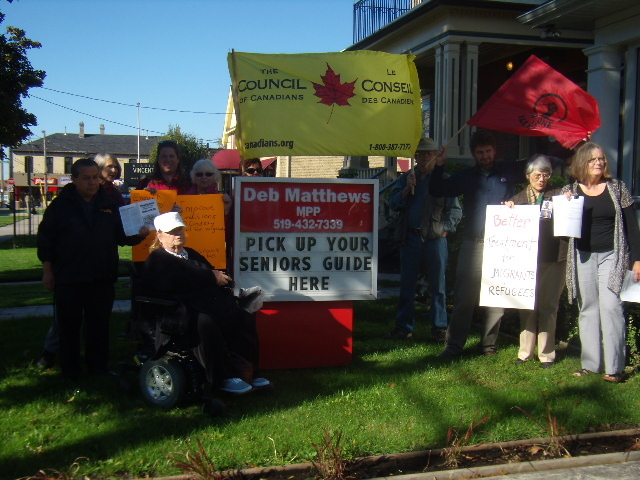 Kingston EPIC (End Prison Industrial Complex) organized a flyering action in front of Collins Bay Penitentiary in Kingston, Ontario. EPIC handed out quarter-page flyers to vehicles at red lights making connections between the ongoing work strike in federal prisons including Collins Bay, the migrant strike in Lindsay, the RTC transfers to Collins Bay, and the closure of Kingston Pen. A copy will be posted at epic.noblogs.org this week, as well as a statement on the work strike by an inmate at Collins Bay EPIC is in touch with. London No One Is Illegal London was accompanied by the local chapter Council of Canadians, trade unionists, Latin American Canadian Solidarity Association, People for Peace London and other community activists from faith and prison justice groups. After delivering the petition and our message to Minister Matthews’ constituency assistant, the activists continued to the local CBC radio studio (less than 2 blocks away) to explain the issues to a journalist and a producer. Ottawa On Tuesday October 8th 2013, a delegation from No One is Illegal (NOII) – Ottawa visited Minister Madeleine Meilleur’s office in Ottawa to show support and solidarity for the nearly 200 immigration detainees who have been on hunger strike in Lindsey, Ontario since September 17, 2013. As the Provincial Minister of Community Safety and Correctional Services, Minister Meilleur has a responsibility to listen to and address the concerns of the immigration detainees. More information and pictures here, here and here. Peterborough At 4 o’clock on Tuesday, October 8th, 2013, a group of about 30 (including some who had attended the demo at CECC earlier in the day) gathered at M.P.P. Jeff Leal’s office. 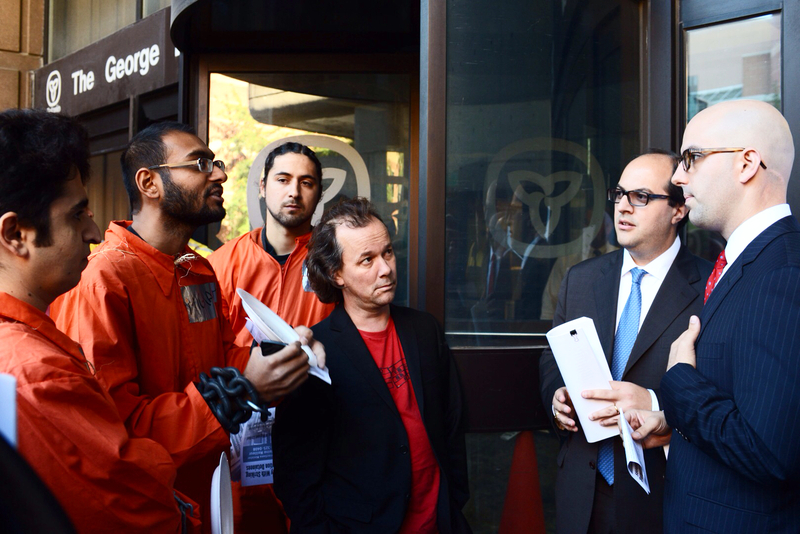 With media and passers by in attendance- the detainees strike demands were read aloud once more and a brief letter was read aloud and then placed in an envelope with the petition for delivery to our M.P.P. Toronto On Tuesday October 8th, families of immigration detainees on strike and dozens of supporters confronted Thomas Chanzy, Chief of Staff for Madeleine Meilleur, Minister of Community Safety and Correctional Services in Toronto. Protesters dressed in orange jumpsuits and tied in chains held out empty food plates and delivered a petition signed by over 1,200 people, demanding an end to cruel prison conditions and indefinite immigration detention. More information here, pictures here and here, audio here.